Beautiful interior decorating for a wedding in vintage style blends spring decor with tender fresh flowers and unique accents in vintage style. Lushome presents these wonderful interior decorating ideas, perfect for a wedding or anniversary events, created by even decor expert from Russia Julia Shakirova. 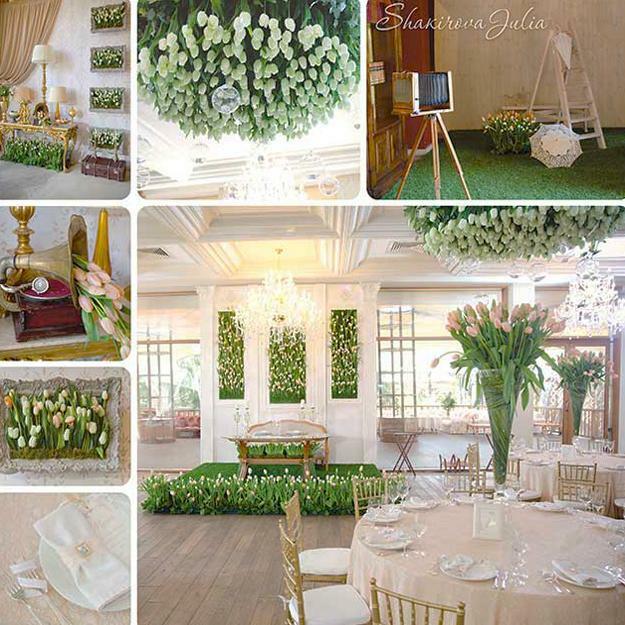 Spring decorating ideas which are light and fresh add an amazing vibe to the wedding decor in vintage style. Fresh tulips add romantic feel, and green leaves of fresh flowers create very inviting and pleasant atmosphere. Beautiful interior decorating ideas give great inspirations for special event decor and make wedding decoration with tulips and vintage accessories look stylish, impressive and inviting. 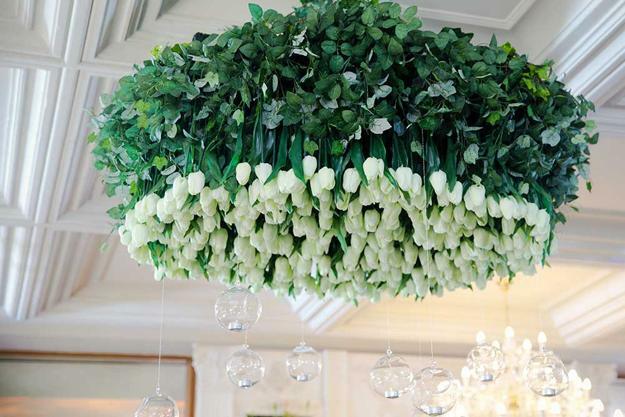 5000 tulips were used for this event decoration. 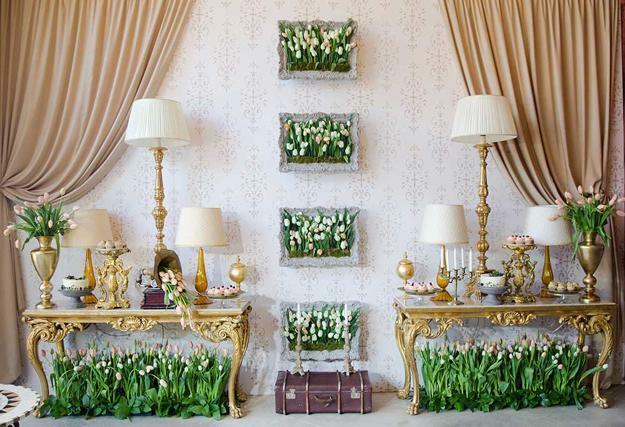 Gorgeous spring decorating ideas by the florist from Moscow are spectacular and luxurious, adding French chic and charm to the event. 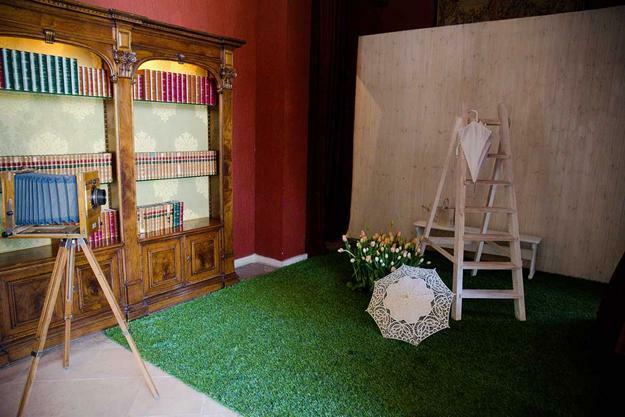 Unique accents in vintage style just increase the effect, providing wonderful welcome area, photography zone and reception area for the special wedding. 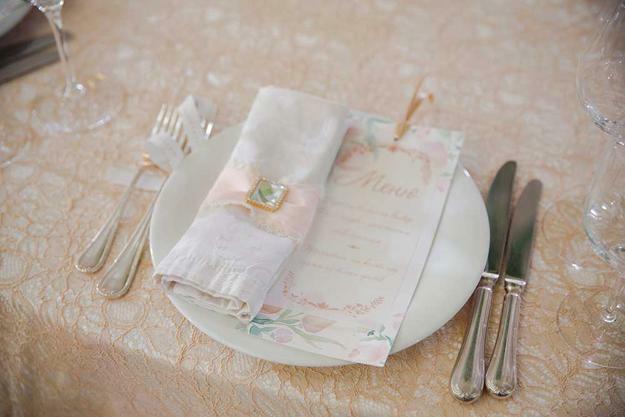 Delicious welcoming treats, rich golden colors, soft creamy tones and green leaves create fabulous wedding decorating. Elegant table decor is amazing, showing off unique vintage items. The leather and embroidered linens, wood and glass, old gramophone, vintage furniture and aged picture frames create interesting, stylish and beautiful interior decorating with fresh flowers. A wooden ladder and a watering can bring unique vintage style and freshness of spring garden into interior decorating, surprising and delighting with gorgeous flower arrangements designed with tulips. 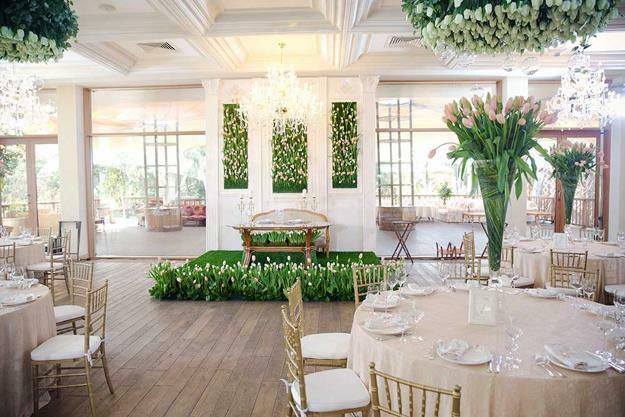 The florist and designer created partitions with grass and added a hanging panel of tulips in the aged gilt frames. Beautifully made a lawn path create a very romantic and meaningful atmosphere. Green glass and grass, tulips and leaves attractively decorate the interior and room furniture. The frames in vintage style and original art objects made ​​of fresh flowers, like tulips sconce with hanging transparent balls and candles make this wedding decor very special and beautiful.